A long-lost painting affectionately known as the “African Mona Lisa” has been placed on public display for the first time in about 40 years. 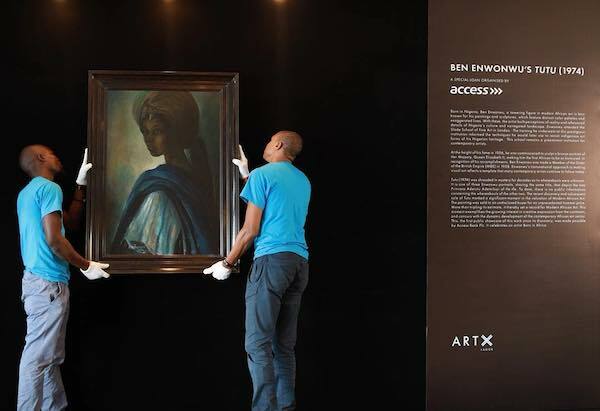 Nigerian artist Ben Enwonwu’s 1974 Tutu painting had been assumed missing until last year, when a family in a London apartment invited a specialist from British auction house Bonhams to appraise the piece. The piece would later become the highest-valued Nigerian Modernist work ever sold at auction. It was sold to a telephone bidder by Bonhams at £1,205,000 (US$1.6 million), four to six times its estimated value of £200,000 to £300,000 (US$263,000 to US395,000). The last time Tutu was exhibited was back in 1975 at the Italian embassy in the Nigerian state of Lagos. It made its first public appearance in 40 years at premier West African art fair Art X Lagos, which took place over the weekend. Tutu, one of three portraits by Enwonwu that explored the aftermath of Nigeria’s bloody civil war, depicts Ife princess Adetutu Ademiluyi, whom the artist had seen walking in the Nigerian countryside. The other two artworks, which also portray the princess, are still missing.